I opened the door this afternoon to find a box I my doorstep from Simon & Schuster distribution. What could it be? 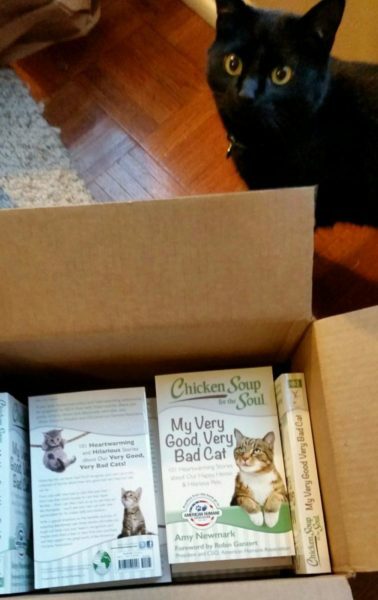 Then I remembered that Chicken Soup for the Soul had told me to expect copies of its newest anthology, My Very Good Very Bad Cat, around this time. I contributed an essay about Lilo’s fabric-eating habit to the book. As you can see, Lilo is very curious about the whole thing. Perhaps she wants to know if there are any other cats in its pages as weird as she is. More likely, she wants to play in the box. But if you would like to read the book and find out about the array of mischievous and not-so-mischievous cats in the universe, let me know. They retail at $14.95 and I’ll even sign it for you. If I find any cat-safe inks, I can have Lilo sign it for you too. Proceeds from any copies bought from me go to Lilo’s medication fund. (The medication lessens her compulsion to eat fabric, but it costs about four hundred dollars a year.) Email me at contact(at)seasonofplenty.com, but use an @ instead of (at). If you prefer to buy from Amazon, I’ll get a few extra pennies per purchase if you use this link.